A large and growing number of parents – particularly parents of Generation Z children – are themselves in the “nones” category (those claiming no religious affiliation). And we live in a day and age where it has almost become a parenting sin to be overprotective, so the pendulum has swung the other way where today’s parents are underprotective (I recently blogged about that HERE.). So how does an underprotective parent who is also unchurched raise their child spiritually? Simply put, they are spiritual, but not religious. They may not want to say, “I’m a Baptist,” but that does not equate with, “I don’t believe in God.” In other words, there is a strong reticence toward labels of any kind. It might help to visualize it in terms of a religious axis and a spiritual axis, creating four quadrants. 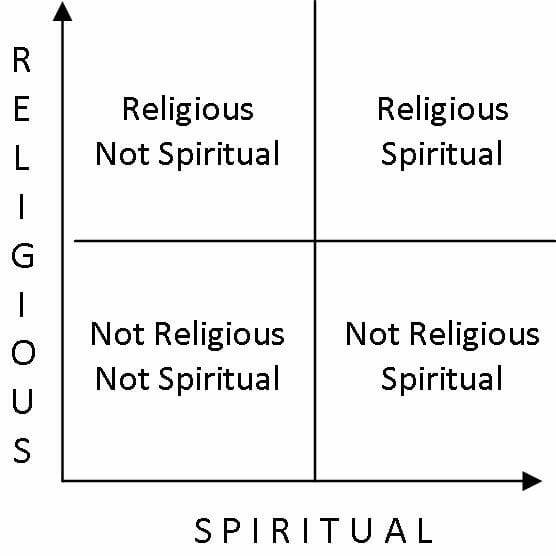 The caricature of the “nones” would place them in the “Not Religious, Not Spiritual” quadrant, but that would be inaccurate. The vast majority belong in the “Not Religious, Spiritual” quadrant. So what of Generation Z? Or more particularly, their parents? But it’s what we have to work with. Ruth Graham, “Why Hold a Child Hostage to My Doubts,” Slate, November 9, 2015, read online. Cathy Lynn Grossman, “As Protestants Decline, Those with No Religion Gain,” USA Today, October 8, 2012, read online. Dan Merica, “Survey: One in Five Americans Has No Religion,” CNN, October 9, 2012, read online.